This year I am very into the fall season. I’ve been really looking forward to October so I can start making Halloween and fall themed goodies. I made this snack mix for Zack’s company picnic. Everyone seemed to really enjoy it. It made our house smell like the holidays. I loved it! The recipe says to use a candy thermometer, but I don’t have one so I used the water method. Read how to tell candy is done here: How to Tell When Hard Candy is Done. Combine pretzels and popcorn in a large roasting pan; set aside. Combine brown sugar, butter, corn syrup and salt in a heavy medium saucepan. Cook over medium heat 12-14 minutes, stirring occasionally until mix comes to a full boil. Continue cooking and stirring 4-6 minutes until mix reaches soft-ball stage, or 234-243 degrees on a candy thermometer. Remove from heat; stir in baking soda and vanilla. 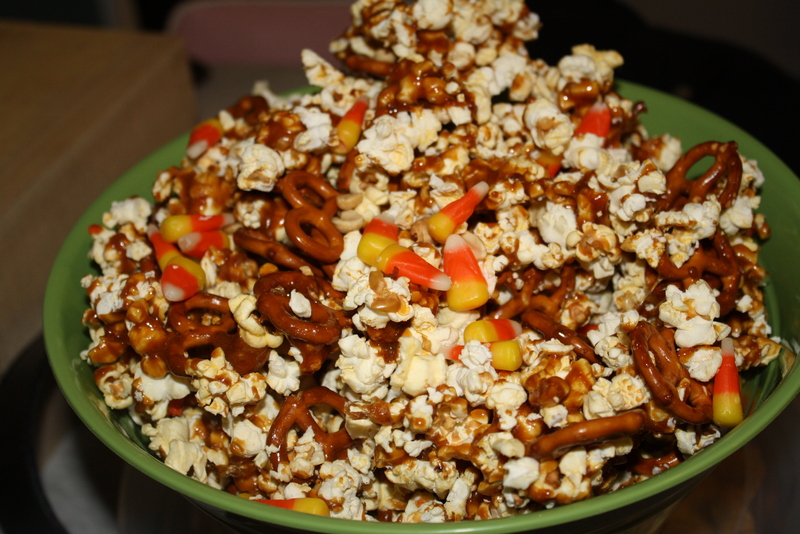 Pour over popcorn and pretzels in pan; add peanuts. Stir until mix is coated well. Bake at 200 degrees for 20 minutes; stir and add candy corn. Bake an additional 20 minutes. Immediately spoon onto wax paper; let cool completely and break into pieces. Store in an airtight container. This is such a fantastic idea for Halloween parties! Thanks for sharing! You’re welcome! If you make it, let me know! I’d love to know how it turned out for you. Sweet and salty together- yum. I so miss candy corns and now living in Hong Kong I know I will not see them again for a very long time. 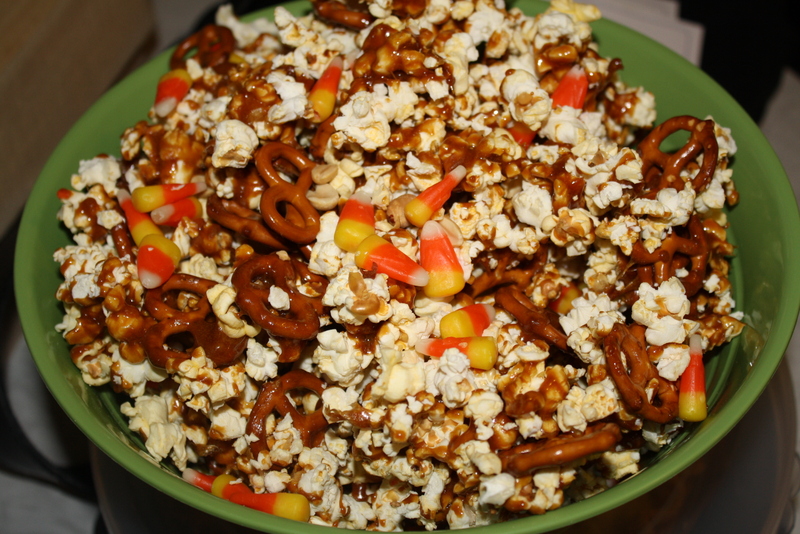 Any alternatives you can think of for the candy corn? Thanks for your feedback! You could really use any type of candy. I’m not sure what kind of candy is in Hong Kong, so I can’t really list examples, but virtually anything would work. Even chocolates, but I wouldn’t put those into the mix but maybe 5-10 minutes before baking is done, so they don’t melt.